Geoff Orazem, Managing Partner of Eastern Foundry visited the studio to expand on how a concept like Small Business Innovation Research (SBIR) can be of value to federal IT professionals as well as contractors. As a result, he has a keen understanding of federal requirements and federal contracting. One concept that is misunderstood is the SBIR. Geoff is uniquely qualified because he has experience as a platoon commander in the United States Marine Corps and a law degree from Harvard. During the interview he gives a detailed explanation of how the SBIR process works and the three phases. Will Roper is the Assistant Secretary of the Air Force and he was quoted as saying, “We want to be your angel investor.” This is one of the elements to understanding how agencies of the federal government can use the SBIR for solving complex problems. There are eleven federal agencies who let their needs known primarily through the portal at sbir.gov. Candidates can review the needs and propose solutions. Once the correct procedures are completed, the long-term objective is to pursue commercial marketing for the solutions offered. 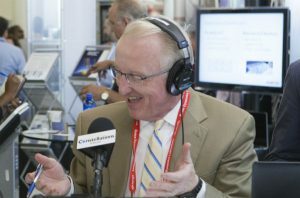 Listen to the interview if you are seeking a better understanding of SBIR and federal innovation.